I had a great time presenting at the 6th annual BRIDGES 2018 Collaboration Forum held on Thursday, February 22, 2018 at Centennial College Event Centre. This Forum is organized by the Toronto East Quadrant Local Immigration Partnership in collaboration with all Toronto Quadrant LIPs and the Toronto Newcomer Office. Technology is playing an increasingly important role in facilitating the work of service provider organizations. How can technology be used effectively to support collaboration, and what tools and resources are there? In this workshop, participants will learn more about how technology can support service collaboration, useful tools, technology platforms and resources, how social media can be used to support collaboration. Participants will also explore advantages, challenges, pitfalls and promising practices in technology use in the social services sector. We explored technology to collaborate with clients and other stakeholders and technology to collaborate internally & with external partners. Most of the time was spent on tech for client use, but most of the lessons and key strategic approaches (such as talk to your clients/users/stakeholders/partners about their use of tech) are applicable to any group you might be exploring technology use with. 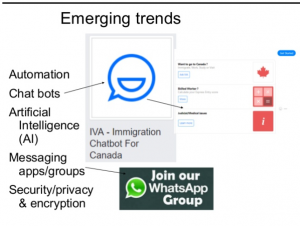 Presentation slides (for download and embedded for quick viewing): Improving communication & collaboration in the age of social media – Marco Campana – BRIDGES 2018 Collaboration Forum Workshop (PDF).